With Father's Day fast approaching, it is time to do your research, make a decision and hope the parcel arrives on time. Or maybe it'll be wiser to go directly to the store, at this point. To me, this is the obvious choice. It's just easier, there's no sizing and there's no doubts on colour preferences. This category is kind of a recommendation. This perfume suits you better. Your skin looks dry, this will help. There's always an excuse to walk by a Space.NK. A gift set is the way to go, in my opinion, because even though a dud might be found in the mix, there's also a chance of finding some really good keepers. I have my eyes set on the Kiehl's Father's Day Set (exclusive to Space.NK), which comes in a handy washbag. It contains: Facial Fuel Energizing Moisture Treatment for Men 75ml, Facial Fuel Energizing Face Wash 250ml, ‘Ultimate Man’ Body Scrub Soap and Ultimate Strength Hand Salve 30ml. 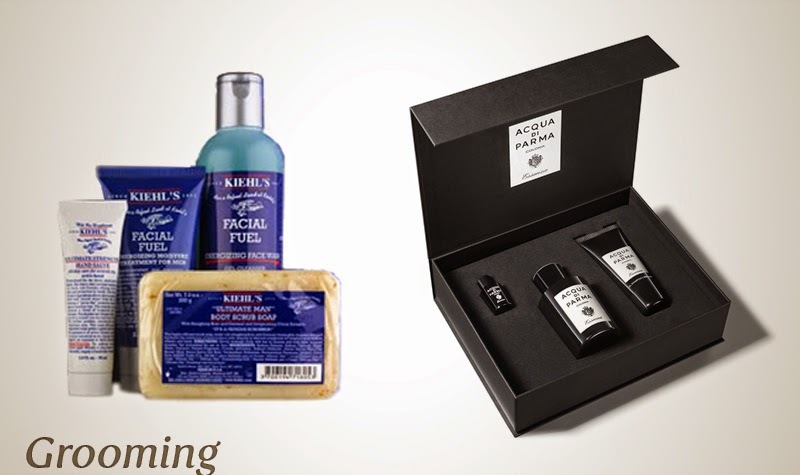 Another great option would be Acqua di Parma's Colonia Father's Day Gift Set. I absolutely love the black packaging of this set, it has a very sophisticated look. Inside the black box, you'll find a Colonia Essenza Eau de Cologne 100ml, a 50ml tube of Colonia Essenza shampoo and shower gel and a collectable 5ml Colonia Essenza miniature. If you know the sizing, or if you're able to take a sneaky peek at Dad's wardrobe, take the opportunity to give him something special, with a detail. Something that he wouldn't pick for himself — if he's not too adventurous when it comes to fashion. Nowadays, there are great options for men, pretty much everywhere. Topshop, Mr Porter and Zara come to mind. In the latter, I've found a Double Collar Blazer and a Shirt With Grosgrain Ribbon. Simple graphic details are very modern looking, ideal for dads. I find men's accessories so cool. They're usually more clean and sleek, in sophisticated colours. Lately, I've been loving the Mr Porter website, for gifts. The service is impeccable and the packaging is truly beautiful. 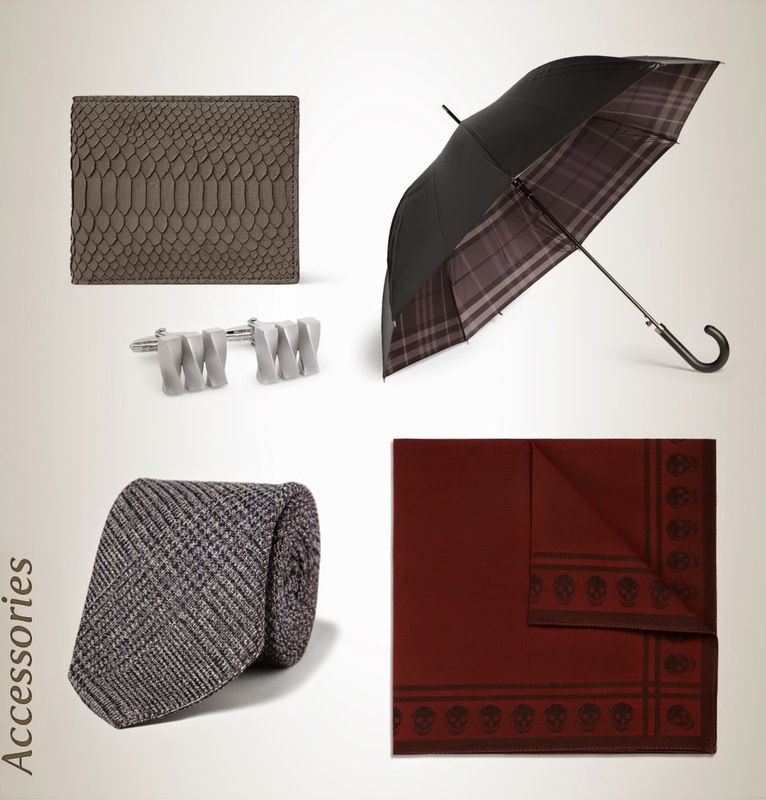 My selection includes a gorgeous Rubberised-Python Billfold Wallet and a very special pair of Metal Cufflinks from Lanvin, a classic Leather Handle Umbrella from Burberry, a Prince of Wales Check Wool and Silk-Blend Tie from Gucci, and, of course, an Alexander McQueen Skull-Patterned Cotton-Blend Pocket Square. If Dad is anything like Stephen Fry, start stalking every blog and publication within the category, in order to find the latest big thing before he does — it'll make him very, very happy — or upgrade a gadget he already owns. The Bowers & Wilkins A5 Airplay Music System would make anyone happy, I'm sure. Otherwise, it's an easy job to find something he actually needs. A set of speakers, a DVD player, a Textured-Leather iPad Sleeve (Marc by Marc Jacobs). Or a Kindle Paperwhite 3G — it's the best.